Motor carriers with regional and long-distance operations may soon be using a technology that can increase the fuel efficiency of semi-trailers by 7% on average. A “confidence report” published by the North American Council for Freight Efficiency (NAFCE) in 2016 lists the fuel savings of two-truck platooning technology at 4% for the lead vehicle and 10% for the following vehicle. Platooning electronically tethers tractor-trailers in a tight convoy formation to reduce aerodynamic drag. A typical separation distance is 40 to 50 feet at highway speeds. Truck manufacturers and aftermarket suppliers have working prototypes now, but a vortex of questions is swirling around the technology: how will it be brought to market? For fleets, the most important metric for the technology is the number of “platoonable” miles, says Dan Jester, Senior Director, Business Development of Trimble Transportation. To get a return on investment of between 13.4 and 24 months, NAFCE estimates that 50 to 75% of the total miles run by equipped tractors and trailers will have to be in a platoon. Large carriers may have enough density in some dedicated lanes to adjust their routes and schedules to achieve those mileages. For intra-carrier platooning, a single company gets to combine the fuel savings from the lead and following vehicle, and is unlikely to care which vehicle goes where. Platooning systems can automatically make that decision. The driver of the lighter vehicle could be instructed by the system to take the rear position, for instance, in order to shorten the gap and minimize the stopping distance. For two-truck platooning to gain widespread adoption, Jester says arrangements must be made that enable inter-carrier platooning. The effort will have to include matching equipment, schedules and routes and reconciliation of the fuel savings, Jester says. “A lot of siloes have to be knocked down,” he says. Jester says inter-carrier agreements may deliver a 4 to 5% fuel savings for the parties in platoons. Although less than the potential, the savings is significant enough to motivate competitors to work together, he believes. Jester is engaged with several truck OEMs and aftermarket suppliers that are developing platooning technology. He is monitoring their progress and discussing opportunities to bring new fuel-saving capabilities to market, he says. 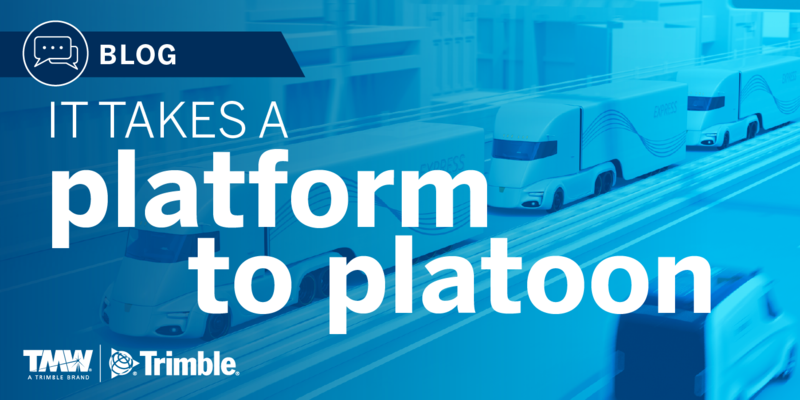 Trimble Transportation is in a unique position to facilitate inter-carrier operations using a platform approach to maximize platoonable miles, record and reconcile the fuel savings and facilitate driver incentives, he says. Trimble systems today can optimally plan routes, match equipment and drivers with loads, and dispatch drivers to ensure on-time departures and arrivals. Inter-carrier platooning would add a new dynamic by creating rendezvous points on a route. Trimble’s fleet mobility systems could automate the driver communications and workflow for platooning, he says. “Our role is to help the platooning market in terms of orchestrating all of these moves that are necessary,” says Jester. 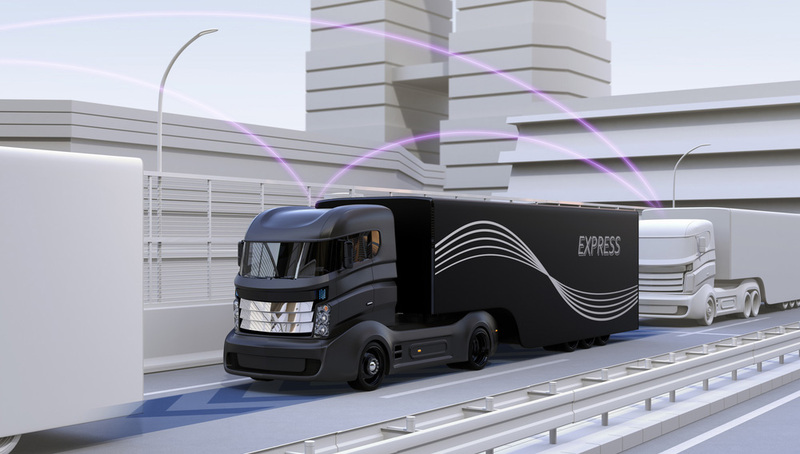 As with any technology that interfaces with drivers, such as electronic logs and video safety systems, platooning has the potential to cause disruption. Imagine the anxiety drivers will have when trailing a vehicle at 65 mph with a separation distance of only 40 feet. Fleets will have to pay drivers extra for platoon miles, he believes, but the incentives can be automatically be tracked and paid out through an integrated fleet management platform. Jester believes platooning will eventually be offered through an integrated mobile fleet management system. This convergence will bring the cost of the system down and make platooning applications part of a driver’s workflow. Platooning may still be a few years out, but Jester is certain it will be part of the future for diesel, electric and other alternative powertrains that are already moving on the path towards autonomy. “Because of the physics, the savings potential and the cost of energy, there will always be a role for platooning,” he says. Are you well-versed and vastly familiar with platooning? What will wide adaption bring? Share your thoughts in our comment section.